Home » review » travel » Around Scotland with a fork 2/2: shellfish at Loch Leven and an odd cup of tea. Around Scotland with a fork 2/2: shellfish at Loch Leven and an odd cup of tea. This is an incredible place. They started off by being shellfish exporters to Europe and as local demand grew for the casual odd lobster or crab, they opened up a little shop which as well as their fish, now sells fab produce and ceramics with a heavy Spanish influence. They finally added a restaurant overlooking the loch, which is unashamedly stuck on to the side of the dispatch centre but very modern and fresh inside. Yup, that is meant for one person. At £35.50 this was a total bargain as it would cost more to buy all of the produce from the fishmongers. Bigger platters can be purchased but judging by this one, I expect they have to crane in the one for four people at £142.00. I tried everything and for someone who isn't keen on these crustaceous beasties, I manage to polish off a decent selection. The mussels and clams were tender and the langoustines were really excellent. I can whole heartedly say I was not converted to the snails and razor clams. I also didn't fight for the single oyster after my recent disaster, but apparently this was the freshest it could be. 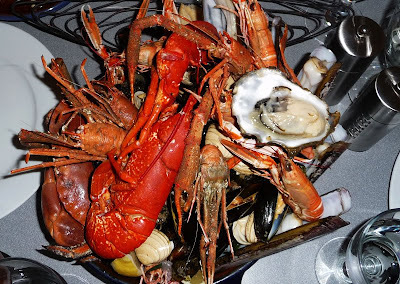 As well as more shellfish there is a varied yet sensibly limited 'alternative' menu with at least one fish of the day as well as veggie and carnivore options. Our table ordered the shell roasted scallops with parsley and almonds, mussels, the brill with roasted peppers and a pan fried halibut. 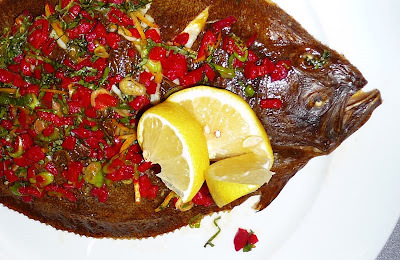 Everything was excellent but my brill really stole the show. The soft roasted peppers sat so well with the fish. Everything was simple and allowed the incredible freshness of the fish to shine through. We polished off a perfect meal with a cheeseboard and elderflower jellies. Also a good sign was the ever refilling basket of bread and olive oil which was top notch quality. They (bloody guidebooks) said there was a tea room here but it turned out to be a rickety old lean-to decorated with shells and twigs off someones house in a little place called Corran. It's past Gleneig and literally at the end of the road. Worth it if you are passing for the sheer bonkers of it and I tip my hat to entrepreneurs in whatever form they take so you go, lean-to lady. I didn't have the guts to take a picture. Google "corran tea hut" if you're curious. 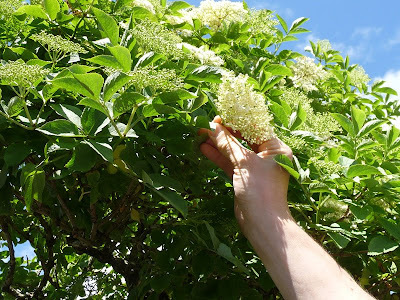 Anyway, Corran is where I spotted the first of the season of Elderflowers. Beautifully free from any pollution here by the coast. I hope someone uses them wisely! And that sums up the highlights of the weeks eating which was 95% great. I won't ruin it by mentioning the Inverness restaurant that broke every food and hospitality rule in the book, but with very little research made on where to eat (unusual for me! ), we were either very lucky or Scotland has a really great standard of restaurants and produce.